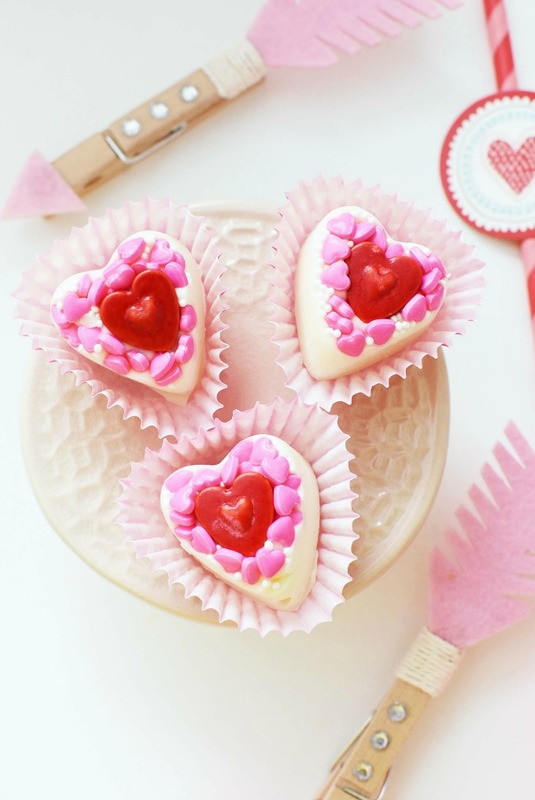 Easy, Adorable, & Quick DIY White Chocolate Valentine’s Day Candy Hearts. This post contains affiliate links. Valentine’s Day is already less than a month away. I recently went to the craft store and picked up some adorable candy hearts because they made me smile and were super cute. I am such a sucker for hearts. 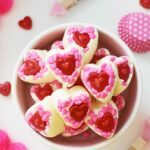 That is why these Easy, Adorable, & Quick DIY White Chocolate Valentine’s Day Candy Hearts were so fun to make. 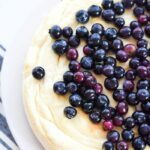 They are hardly a recipe but more like an edible craft that I know my kiddos would enjoy and appreciate. I have had this heart-shaped mold for years (this one is the closest I could find on Amazon) and only used it one other time. To be honest, I probably could start a craft store with all the stuff I have. 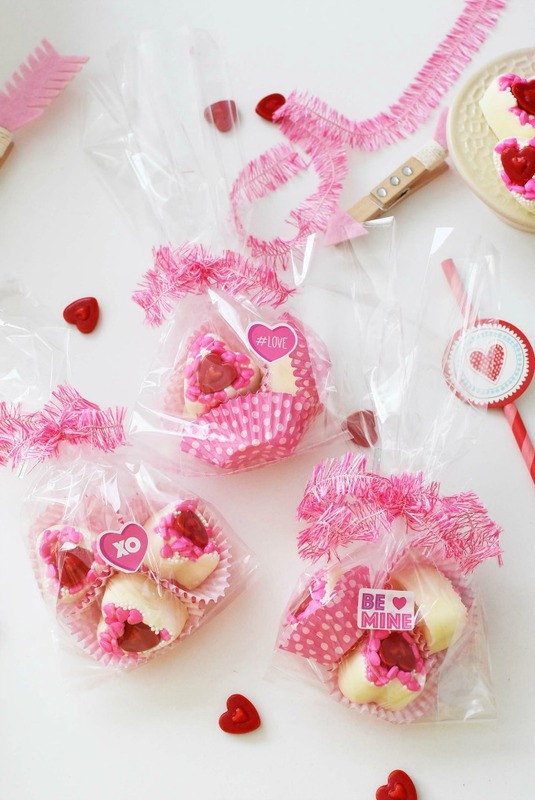 The adorable fuzzy ribbon I used to tie off these Valentine’s Day treat bags was brand new. Oh, but did I mention I bought it 4 years ago. While I am by no means wasteful, sometimes I am a little too ambitious when it comes to those 90% off sales after the season. But, it kind of works sometimes and this year I am vowing to actually use what I have rather than constantly buy more. Ok, so the Rae Dunn pottery I recently bought is the exception. I just love her stuff so much. In a perfect world I would have it all displayed nicely for each season. I mean it is just so pretty, unique, and it matches my farmhouse style. Maybe my husband will gift me some for Valentine’s Day..but maybe that is wishful thinking! 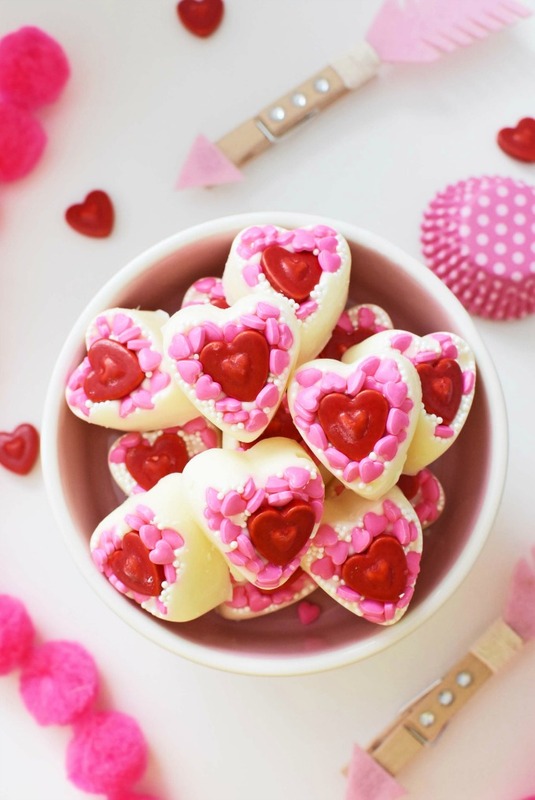 Ok, let’s focus on these Easy, Adorable, & Quick DIY White Chocolate Valentine’s Day Candy Hearts. I made them with premium white chocolate melts and not those cheaper candy wafers so they are really tasty. You can find quality white chocolate melts at the grocery store, or Amazon. These are made to be able to be microwaved and come with special instructions on how to do it. I followed them and it produced the creamiest chocolate ever that was pour-able and yummy. For the candy, I used 3 different Valentine’s Day Sprinkles which include larger, red hearts. You need to line them in your mold first. Be sure to center your main heart and evenly disperse the other sprinkles. 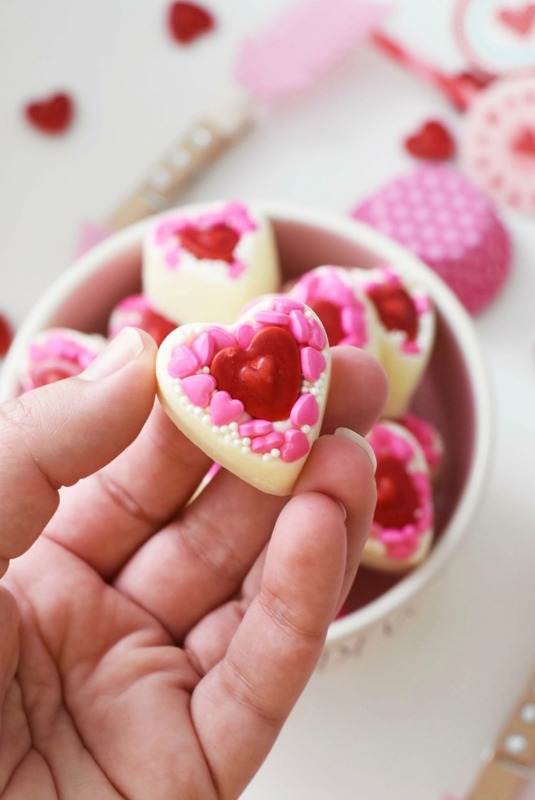 Then, you pour over the white chocolate carefully into each heart space. You might have some running over, but a small rubber spatula can easily help you even it out. 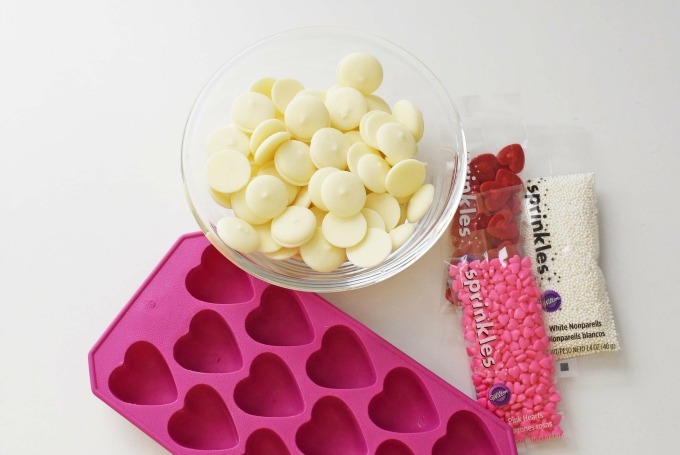 One bag of chocolate melts was enough for this mold which has 15 heart spaces. After the chocolate is evenly spread into each space, place the mold in the refrigerator for a good hour to firm up the chocolate. 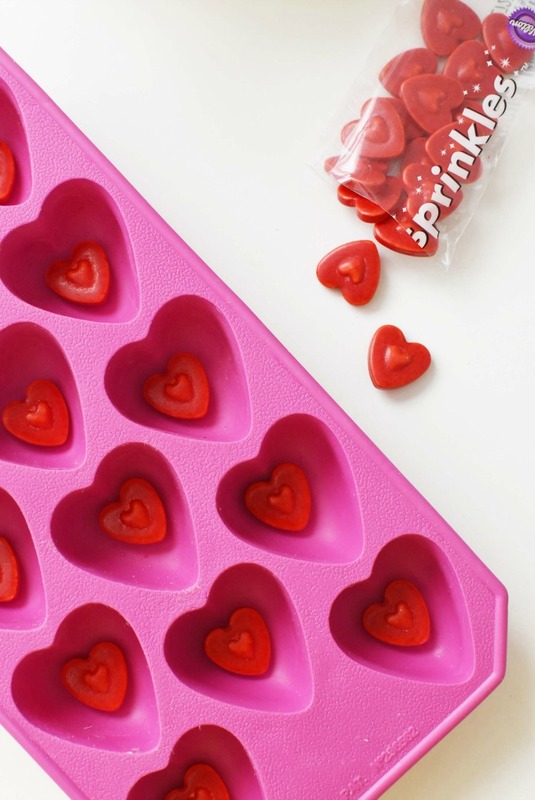 Once the chocolate is firm gently pop each candy heart out of the mold and place them into mini candy cup liners (like baby cupcake papers). Gift them to your kids, friends, or family and watch them smile. This project cost me $5.75 to make because I needed to buy the 3 sprinkles bags, and the chocolate. I had the heart-shaped mold, bags and ribbon on-hand. Overall, I think this is a fun activity to enjoy the season of love. 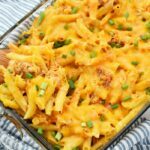 Get this printable recipe below! 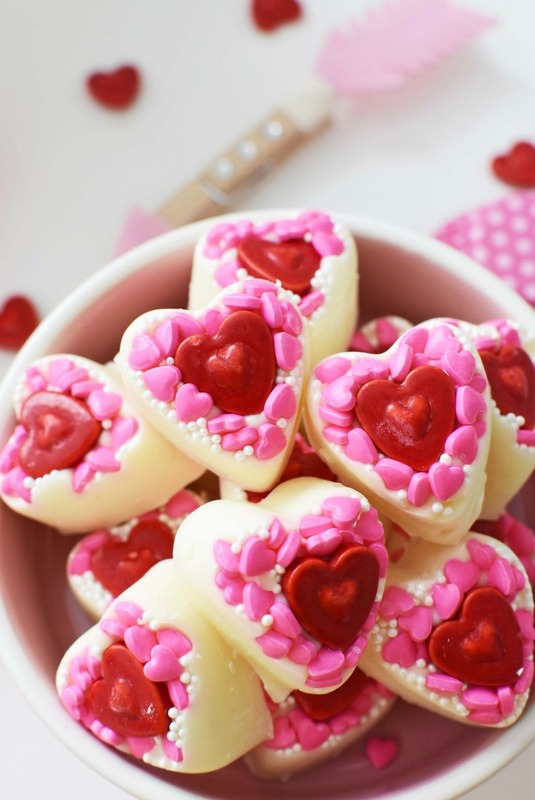 Delicious white chocolate candy hearts with cute Valentine’s Day sprinkles in each. Perfect for gifting! 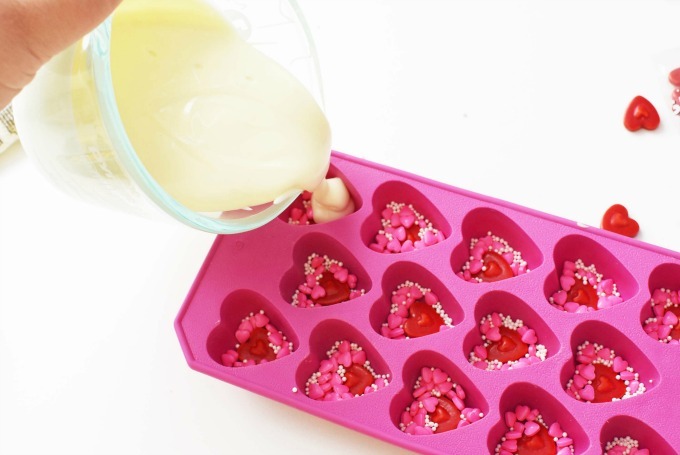 In a microwave safe bowl, melt candy melts in the microwave in 30 second intervals. Be sure to stir in between each session until creamy. 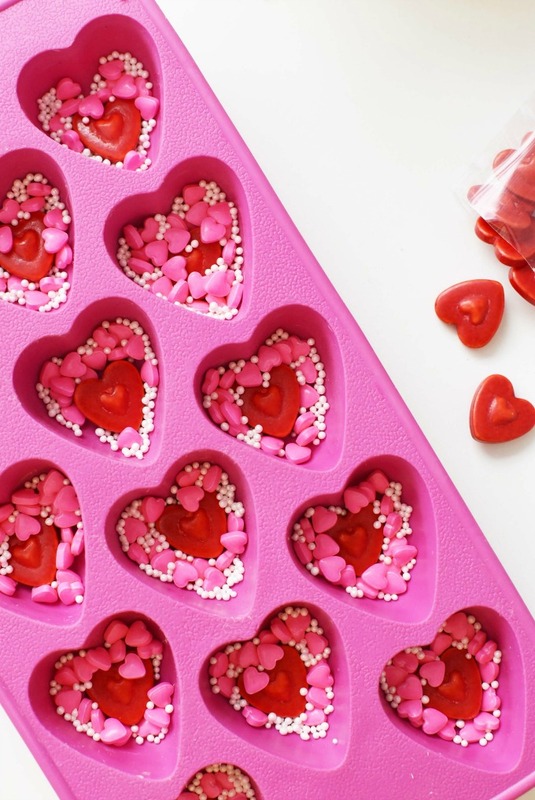 Line your heart-shaped mold with candies and sprinkles. Place in the refrigerator for 30 minutes or until hardened. Once candies are hard, pop them out of the mold and bag or enjoy! 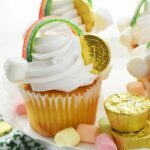 These do look adorable and easy to make! 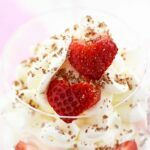 Perfect treat for after dinner for Valentines! I love how easy this is to make but still looks ultra cute! I hardly have time to do anything but I can definitely pencil these in. I love chocolate and these look so easy to make. 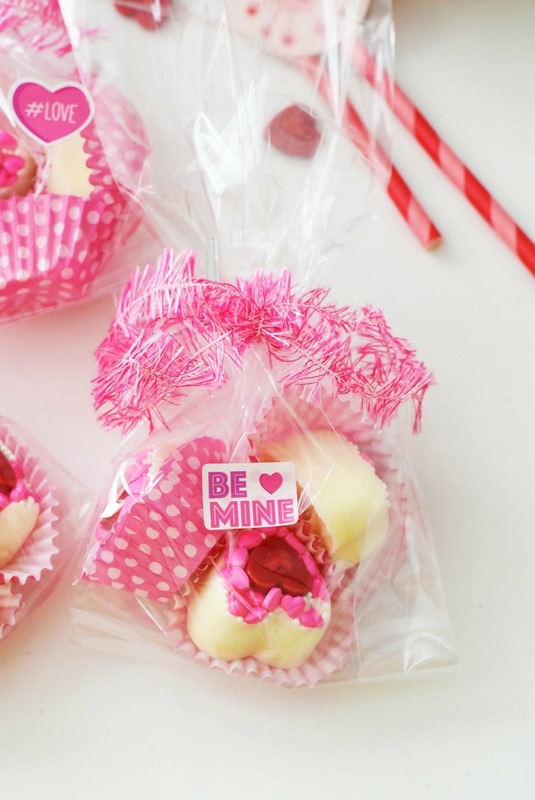 I’ll be getting my groove on and creating some festive V Day candy! These are so cute! What a lovely idea for Valentine’s Day! These are so festive and pretty! I think they would look lovely on a cake or on top of cupcakes too. What an adorable idea. These are simple enough anyone can enjoy it. These are totally cute! The kids will love these ones for sure. Talk about a nice treat for the kids this Valentine’s Day! I love giving out something sweet and this is perfect! It’s so easy to make! I would love to make this with my kids! I’m sure they’ll have fun helping out in the kitchen. It’s really quick and easy and it’s so affordable! Fantastic idea! I love how these candy hearts turned out. 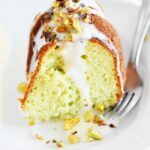 It looks so simple and easy to make. I could probably pull this one off. If I cam successful, I will make a lot of these and give them to my friends for Valentines.